Many thanks to those who were able to attend the second Advice North Somerset Conference on 16th September. Over fifty people from 27 organisations attended and took advantage of the opportunity to network with colleagues from the advice & information sector. The event provided an opportunity to meet Fiona Cope who welcomed everyone to the event. Fiona is the new Chief Officer of North Somerset Citizens Advice Bureau and Lead Partner of Advice North Somerset. The Conference theme was “Like it or not, the World is Going Online, so How do We Meet the Challenge?”. The first presentation was “Digital First at North Somerset” from Kieron Kilbride, Simone Woolley, Allison Adlam and Jenny Cooper and included a demonstration of the North Somerset Online Directory. 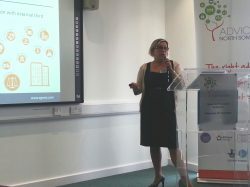 Following this was a lively “Frontline Perspective” from Jane Warren who is the Advice North Somerset Caseworker and a thought-provoking presentation from Michele Chupa of Egress Software Technologies on “How Secure is Your Email?“. These themes were pulled together in a discussion session at the end of the Conference. Again, we need to capitalise on the energy and ideas generated by the Conference. A draft action plan is being produced to take to the next Advice Forum in December to which you are all cordially invited.